If you haven’t noticed by now, I try to balance out the recipes on Yankee Doodle Paddy with some naughty and some nice. I am not a vegan or vegetarian but I do enjoy eating and cooking that way from time to time. I try not to eat too much dairy, but since butter is one of my fav things in life I do allow it, when it is worth it. Well today’s recipe is one of those days! It is the 78th edition of Woman Crush Wednesday and our gorgeous gourmet gals (yes plural) are Martha Swift and Lisa Thomas of Primrose Bakery here in London. 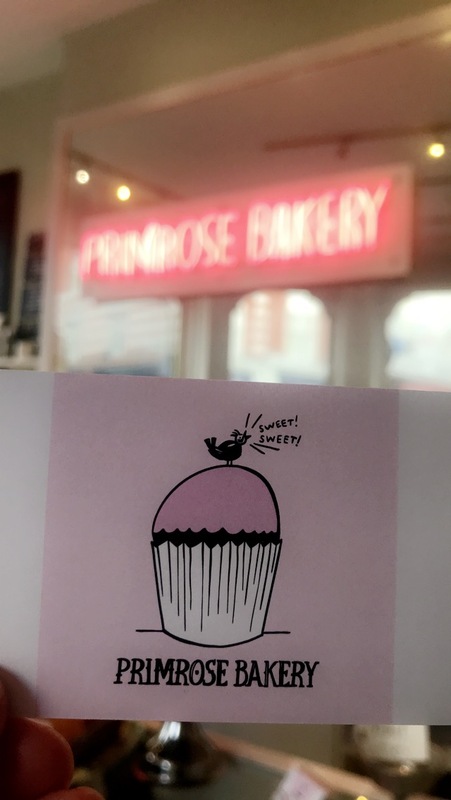 I visited one of the Primrose bakeries in Covent Garden for a Foodie Fieldtrip Friday a couple weeks ago. 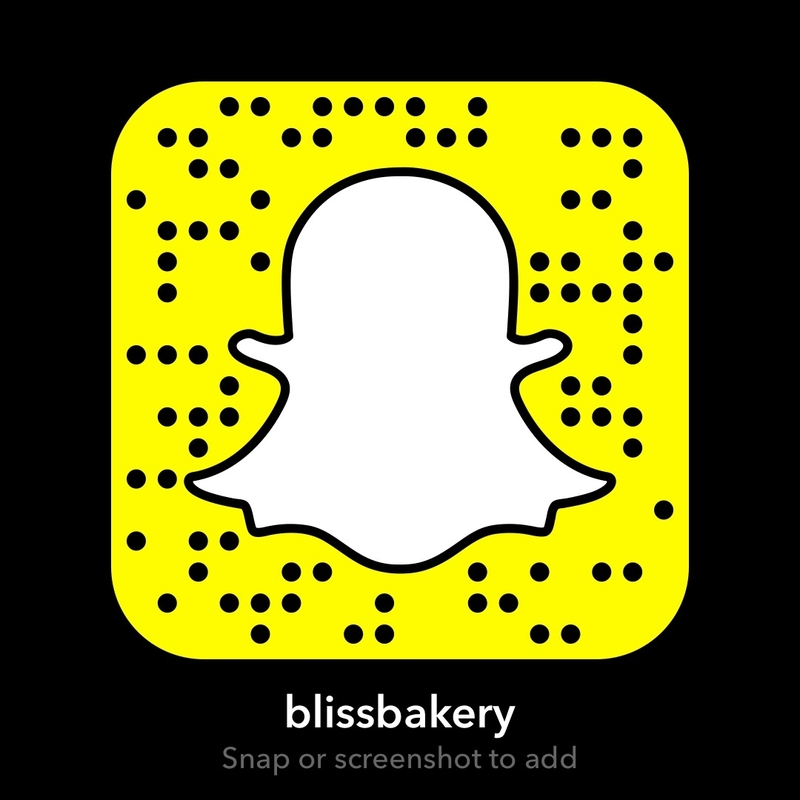 The bakery is mouthwatering and I had a hard time choosing what to order. 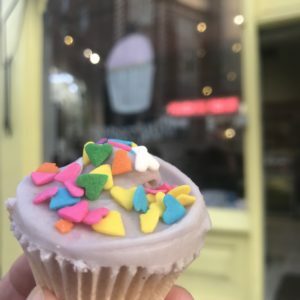 In the end I got three mini cupcakes. Yes I decided I wanted a cupcake then I couldn’t decide which one! 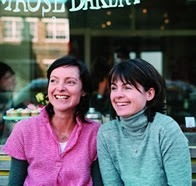 Martha and Lisa first started Primrose Bakery back in 2004. 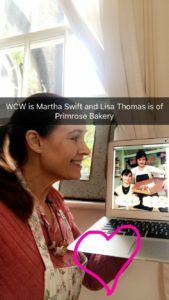 They met when their children were in preschool together and started their first baking venture out of their homes. The first shop was in the Primrose Hill section of London. Now, besides the Covent Garden location I visited, there is also a third branch in Kensington. With several cookbooks, I had loads of recipes of theirs to choose from. 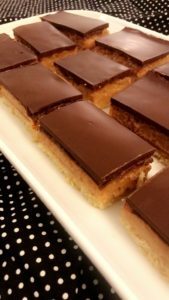 But for today’s tutorial (since I always do a WCW recipe I’ve never tried before) I decided I would make their famous Caramel Slices. To make the biscuit base, sift he flour and sugar into a bow. Add te coconut and butter and mix together with an electric hand mixer until well combined. Press the mixture evenly and firmly into the baking tin. Bake for about 10-15 minutes, until golden brown. Do not over cook or it will have a tendency to break apart. To make the caramel, put the golden syrup, butter and condensed milk into a saucepan over low heat until the butter is completely melted. Continue cooking for 7-10minutes as the caramel thickens and darkens in color. Pour it over the prepared base and put back in the oven for 20 minutes. Remove from the oven. Once it has completely cooled, prepare the chocolate topping by melting the chocolate and oil together very carefully either in a heatproof bowl set over a saucepan of simmering water or in a microwave safe bowl in the microwave (heat for 1 minute, stir and heat for a further minute). Pour the mixture over the caramel and smooth gently over the top. Allow to set before removing the whole slab from the tin and cutting into slices. You could sprinkle some cocoa powder over the top through a sieve just before serving. So this is my night sorted! 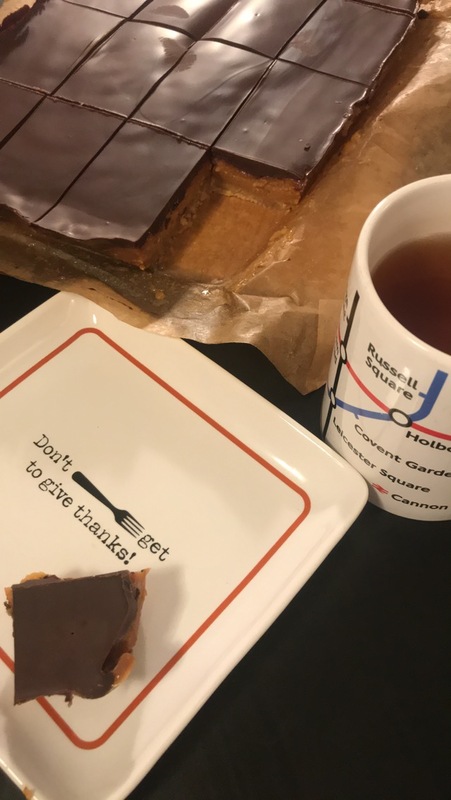 I’ve got my cuppa tea (in the London Tube map mug showing Covent Garden) and working on the other half of the caramel slice I nearly inhaled! Wow this is the best caramel slice I’ve ever tasted. The layers are luscious and that caramel is divine. 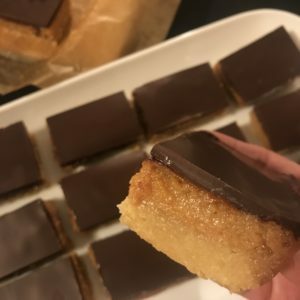 I am a huge coconut lover and that little bit in the biscuit base is to die for! 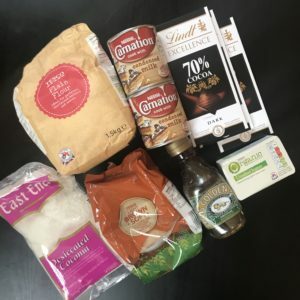 The recipe is super simple to follow and not too many ingredients. It does take a bit of time only because there are down periods in the process when waiting for things to cool. But sure I kept busy with my fur baby Stella and housework. It was worth the wait! 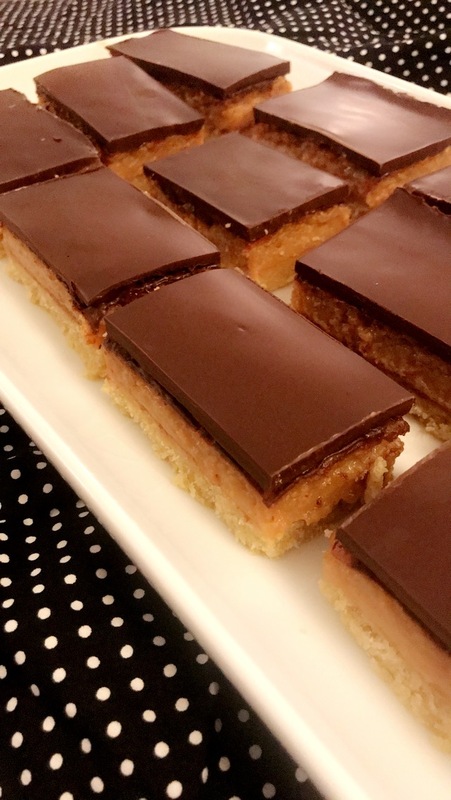 I am so excited to share these caramel slices as gifts! It is great to be giving, and also it saves me from myself so I don’t eat them all! . 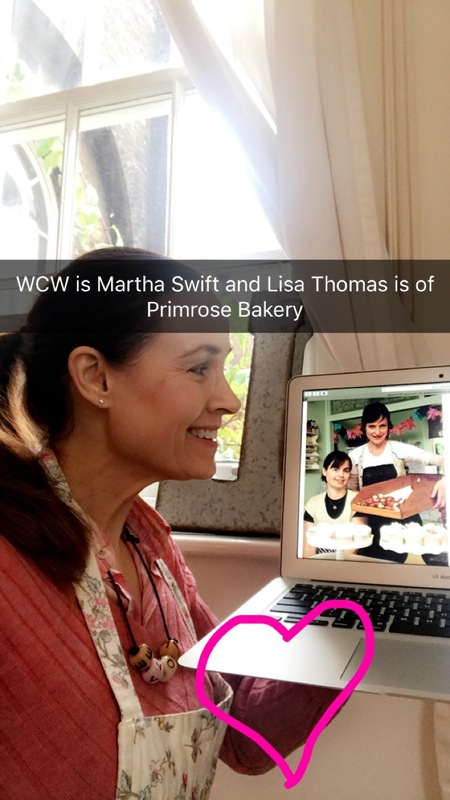 While Lisa pulled away a few years ago from running the Primrose bakery, Martha is still involved. 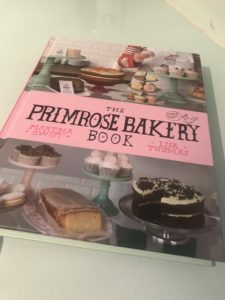 But they have forged a life long legacy of high quality delicious baked goods, darling bake shops to indulge in the treats and fabulous cook books to recreate them at home. A massive role model for women in business and in the culinary world! Thanks for the inspiration ladies! You’re awesome!